Thank you for your interest in the Lamppost Education Initiative (Lamppost). 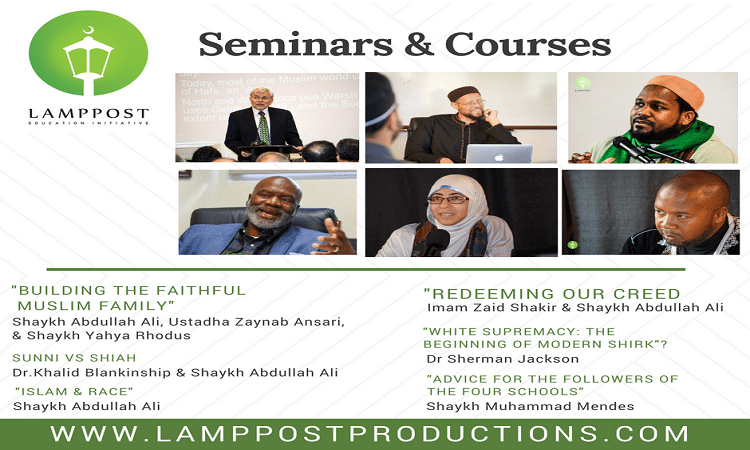 We feature highly qualified and accomplished Muslim American scholars who address issues of relevance and concern for Muslims living in the West. While our courses and seminars are an in-depth study of important topics, you can study at your own pace. During this month of Rajab, we have a special offer. Purchase Shaykh Abdullah bin Hamid Ali’s “A Brief History of the Qur’an & Related Sciences” and you get “Muslim Spirituality: From Africa to the Americas” with Shaykh Muhammad Mendes and Shaykh Yahya Rhodus-FREE! In a special upcoming online seminar, Dr. Khalid Blankinship will provide a detailed, historical look at the Crusades! Please click HERE for more details and to register. . The Lamppost Education Initiative is a non-profit, 501c3 organization. We feature a wide range of articles, videos, live & online seminars, courses, and much more. Our offerings are designed to help Muslims from all economic and social backgrounds to learn more about the Deen of Islam. May Allah reward you and increase all of us in useful and beneficial knowledge!